A large number of industries depend upon outside support for completing manufacturing activity. Job work means undertaking any treatment or process by a person on goods belonging to another registered taxable person. The person who is treating or processing the goods belonging to other person is called ‘job worker’ and the person to whom the goods belongs is called ‘principal’. Section 143 of CGST Act, 2017 states that a Principal under intimation and subject to such conditions as may be prescribed can send inputs or capital goods to a job worker without payment of tax for further process or treatment and from there subsequently to another job worker(s) and shall either bring back such inputs/capital goods after completion of job work or otherwise within 1 year/3years of their being sent out or supply such inputs/capital goods after completion of job work or otherwise within 1 year / 3 years of their being sent out, from the place of business of a job worker on payment of tax within India or with or without payment of tax for export. b) where the principal is engaged in the supply of such goods as may be notified by the Commissioner. The responsibility for keeping proper accounts for the inputs or capital goods shall lie with the principal. Any waste and scrap generated during the job work may be supplied by the job worker directly from his place of business on payment of tax, if such job worker is registered, or by the principal, if the job worker is not registered. Under GST regime, when goods are sent from a taxable person to a Job worker it shall be treated as supply and will be liable to GST if the goods so sent are not received back within 1 year or 3 years in case of inputs or capital goods as the case may be. For the purposes of job work, input includes intermediate goods arising from any treatment or process carried out on the inputs by the principal or the job worker. 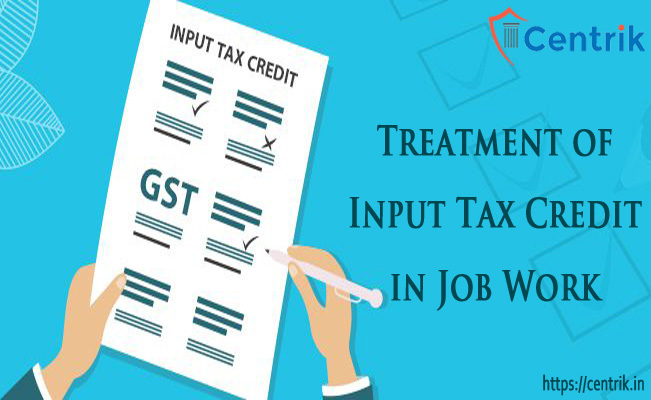 Section 19 of the CGST Act, 2017 states that the principal shall, subject to such conditions and restrictions as may be prescribed, be allowed input tax credit on inputs sent to a job worker for job work. Although section 16 of the CGST Act, 2017 specifically states that ITC will be provided only when goods are actually received, but under Job work this condition is exempted and ITC can be availed even if inputs or capital goods are directly sent to the Job Worker without being first brought to the place of business of Principal.